Senator Grassley investigation in the financial dealings of TV evangelists - Joyce Meyer, Benny Hinn, Eddie Long, Creflo and Taffi Dollar, Kenneth & Gloria Copeland and Paula & Randy White. Ethics, walking uprightly and avoiding offence in ministry. Dec. 13, 2009 - PRLog -- I came to Christ through Pat Robertson's 700 Club TV show. The Presence of God filled my heart and bedroom following that broadcast. Jesus anointed a rooster to crow and speak to his backslidden apostle Peter who denied Him three times. God in the Old Testament used a donkey to speak to a rebellious prophet. So know assuredly God's Word can bless people through TV. It is natural for ministers who pay a heavy price to consecrate themselves and sacrifice decades of their lives to remain pure and be carriers of God's glory to by reason of their divine association to be greatly blessed. Show me your friends and I will show you your future. There is no greater friend than God. Let's not forget God has gold streets in heaven and He desires to prosper His servants on earth (see Psalm 35:27). Hence God's magnificence and glory can be transmitted to His ministers and their ministries. Fame and fortune therefore follows as a result. As long as these ministers remain humble and keep their eyes on Jesus, give God the glory and continue to abide in their heavenly callings without distraction the blessings shall continue to flow. Certainly it is easy for the followers of Christ to become fixated on the vessels and chosen servants the Lord uses. Yet such is a hindrance and distraction for the people of God, because God alone ultimately is our Source. Pastor Benny said tonight (Dec. 12, 2009) at his Fire Conference in Orlando, FL that it wasn't until he took his eyes off of Kathryn Kuhlman and put his eyes on God as His Source that God began to anoint and empower him. That is one thing I always appreciated about Pastor Benny (as I attended his church for 2 and 1/2 years, completing a youth Bible Training with him over a 13 week period back in 1991). Pastor Benny always warned us never to touch the glory, girls or gold. He said that if our hands would not get greedily sticky, the Lord would allow money to flow through our hands to do the work of the ministry. 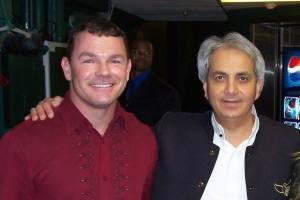 Pastor Benny Hinn announced tonight (Dec. 12, 2009) that in 2010 he would not take one cent from Benny Hinn Ministries and committed to live entirely by faith. Although God did not command him to do so, to avoid reproach and for the gospel's sake Pastor Benny (the prince of the man of God that he is) has chosen to not touch a penny of the offerings of Gods people that go into his ministry. Pastor Benny in my opinion is one of the most pure hearted ministers on the planet. The depth of his love for Jesus is evident when he leads worship in his services and sings the timeless hymns of the church. The loving, heart melting Presence of God is frequently present in his meetings and God always gets the glory for everything done in Jesus Name. As declared by Jesus in Mark 10:28-31 the blessing of the Lord comes with "persecutions" of all types as people get jealous, envious and bitter. Yet since "God is no respecter of persons" (Acts 10:34-35) if we will learn and live according to God's ways (Psalm 103:7) we too can obediently walk right into our personal promised land and divine inheritance (Acts 20:32; Ephesians 1:17-18) and ourselves also be greatly blessed. Therefore having money is not evil, as it undergirds and sustains the work of the ministry. What is questionable however is the allocation of funds donated with sincerity of heart to ministry purposes that are alternatively earmarked and used for the minister's own lavish lifestyle. I do believe in prosperity, though I am far from it in my own life. Moreover I believe many of these famous ministers sowed in tears in their early years of ministry and are entitled to live well for faithfully serving well (most of the accused for decades). Why should a drug dealer and foul mouthed rap singer be allowed to roll in the dough and live large, but not a minister? "I'm following up on complaints from the public and news coverage regarding certain practices at six ministries," Senator Grassley said in a statement. "The allegations involve governing boards that aren't independent and allow generous salaries and housing allowances and amenities such as private jets and Rolls Royces. I don't want to conclude that there's a problem, but I have an obligation to donors and the taxpayers to find out more. People who donated should have their money spent as intended and in adherence with the tax code." Another point worth noting is TV is not cheap. I'd love to go on Christian TV, but can hardly afford consistently paying for such a broadcast. I can only imagine the multiplied millions that are necessary to pay to be on TV in 200 countries, as Pastor Benny's "This is Your Day!" program. People should also keep in mind that ministers like Pastor Benny earn a lot of their money from book sales, which royalties they as authors are entitled to enjoy. As an author myself, I know writing a book is a lot of work. Certainly Bishop Eddie Long (Lithonia, Ga.) has greatly impacted the community and nation with his politically active congregation of over 25,000. Grassley seems to have a problem with a God that blesses both financially and spiritually, but this is Bible Senator. Pastor Creflo and Taffi Dollar (College Park, Ga.) have a thriving broadcast known as "Changing Your World" which is seen in more than 150 countries. Economic empowerment is important and helpful to people abroad as the demand for such programming is evident. Kenneth and Gloria Copeland (Newark, Texas) have a broadcast and publish the "Believer's Voice of Victory," which touches and strengthens people throughout the world. The Copelands themselves have been very generous giving to many ministers and charitable causes. The Bible says, "godliness is profitable in all things" (1 Timothy 4:8). Pastors Randy and Paula White (Tampa, Fla.) overcome great adversity and setbacks in their personal lives to build Without Walls International Church which has mightily impacted the poor and helped the disenfranchised throughout their community. Few Pastors dare to lift those in the inner-city as have the Whites, who surely have sown in tears personally while ministering to humanity. Joyce Meyer Ministries (JMM) apparently was the first to receive an inquiry letter regarding her ministry's financial integrity from the Republican staff of the Senate Finance Committee led by Senator Grassley. JMM continues in its desire to be transparent, and has posted its 2003, 2004, 2005 and 2006 audited financial reports on the ministry website. Also available for viewing are the 2004, 2005 and 2006 annual reports (above and beyond the level of accountability required by law and/or that expected by most donors). JMM has been committed to helping hurting people for more than 20 years, and is proud to point out that in 2006, 82% of its total expenses were used for outreach and program services directed toward reaching people with the Gospel of Jesus Christ. When I was in India, Joyce Meyer had just left and the Indian Pastors were telling me how she was giving them bicycles and TVs for ministry purposes. JMM also provided more than 11 million meals in 2006, and built nearly 200 freshwater wells and churches in underdeveloped countries. The ministry fully funds and operates more than 50 orphanages around the world, and presents the Gospel to a potential audience of 3 billion people every day via its television program. As the government takes on the powerful Church world, the ministers of God should simultaneously be standing up and pointing out the corruption in government. Consider the hundreds of millions of dollars wasted on bailing out corporate crooks on Wall Street, who had no intention of repaying the government and taxpayers. Wars overseas are not cheap either and come at the cost of precious human lives. Truly "judgment begins in the house of God" (1Peter 4:17) after which America itself shall be judged for wasteful spending on Wall St. and war without end. Certainly I am a babe in Christ doing my personal best like Pastor Benny to preach the gospel around the world (on a much smaller scale), having traveled to 55 countries where I have visited many impoverished third-world and war-torn nations. Unfortunately I have never had the financial wherewithal of these great ministers and have greatly depleted my own personal savings serving the Lord rarely having enough to take much of a salary. Yet I believe God is faithful and will restore me and bless me above and beyond all I can ask or think as He has promised (Ephesians 3:20; Mark 10:28-31)...even a hundredfold thereby enabling me to again go to and fro throughout the earth preaching His Word to save souls.